Outlaws and the End of the Frontier. During this period and until the start of World War I there were many photographers whose work was well documented and avidly collected. There were also particular events and people who became photographic celebrities, including the massacre at Wounded Knee, Indian leaders, soldiers, trappers, frontiersman, outlaws, and lawmen. Among the most famous subjects were Geronimo, Chief Joseph, Red Cloud, Quanah Parker, Custer’s Crow Scouts, Custer, Buffalo Bill and the members of his Wild West show, Pawnee Bill, Wild Bill Hickcock, Butch Cassidy and the Wild Bunch, Jesse James, Doc Holiday, Pat Garrett. Photographers who made portraits and views during this era are often unknown, or the images were made by studio and commercial photographers throughout the territories, but highlights include George Traeger and his Northwest Photographic Company’s views at Wounded Knee massacre (1890), and John H. C. Grabill’s views at Pine Ridge before and after the Wounded Knee massacre. Camillus Fly (b. 1849; d. 1901, Tombstone, Arizona) made a series on the capture of Geronimo in 1886. A visit to Paris by a group of Omaha Indians in 1872 was photographed by Pierre Petit for Prince Roland Bonaparte. J. N. Choate photographed views of Indians at the Carlisle Pennsylvania Boarding School. A. Frank Randall made views of Apaches and Geronimo. J. [W] E. Irwin photographed Geronimo the Southern Plains tribes in Oklahoma Territory in 1900. Frederick Maude, E.E. Hall, George Wharton James and G. L Rose all worked out of Pasadena in the 1890s. Herbert Gleason worked both in the eastern and western U.S. making exquisite hard focused platinum prints landscapes in Mesa Verde, the California Sierras and Alaska in the 1910s. Grace Chandler Horn’s platinum print pictorial views of Great Lakes Indians were used as illustrations for Longfellow’s, The Song of Hiawatha in Michigan in the 1900s. Roland Reed’s (b. 1864, Fox River Valley, Wisconsin; d. 1934) created a romantic vision of the Indian at Glacier National Park in the 1910s. During this period many of these photographic businesses flourished, allowing the owners to open multiple studios and sell literally thousands of prints. Views range from tintypes and carte de visites to mammoth plate prints, albumen and silver. John A. Anderson (b. 1869, Vinberg, Halland county, Sweden; d. 1948, Atascadero, California). Anderson’s family immigrated to Pennsylvania in 1870. He moved west in 1883 with his father and three brothers and settled near Fort Niobrara, Nebraska. In 1886 he was apprenticed to William R. Cross, who had an established studio at Fort Niobrara. In 1889 he was the official photographer for the Crook Treaty Commission at the Rosebud Reservation in South Dakota. He was a successful merchant and businessman, devoting most of his energies to these ventures after 1900. He made photographs until about 1929. His greatest formal and informal portraits and views of Indian life were made from 1888 to 1910. He made silver prints generally in the 4.5 x 7.5” range. David F. Barry (b. 1854, Honeoye Falls, New York; d. 1934, Superior, Wisconsin). As a teenager Barry became proficient as a photographer working with O. S. Goff in Columbus, Wisconsin. In 1878 he began managing Goff’s studio in Bismarck, North Dakota and in 1881 traveled west in a wagon outfitted with a dark room. He took over Goff’s studio and published Goff’s prints under his own authorship. He photographed gatherings of important Indians, particularly of the Sioux who had killed Custer - Gall, Rain-in-the-Face and Sitting Bull. He continued photographing these and other Indians and various reunions of the Battle of Little Bighorn for over 40 years. In 1884 he founded his own studio, settling in Superior, Wisconsin in 1890 where stayed, except for a year in New York in 1897-1898. Through his photography he became friends with Wild West show promoters Buffalo Bill and Pawnee Bill. His early prints are albumen, usually cabinet card or slightly larger. He also made many silver prints while in Superior. Christian Barthelmess (b. 1854 Klingenberg, Germany; d. 1906, Fort Keogh, Montana) A musician with the army, Barthelmess began photographing in Ft. Apache, Arizona in 1876 and continued while stationed at other forts in Arizona, Colorado, New Mexico and Montana. For thirty years he made views of Army life and Indians, casually and formally posing pictures of ice skaters, fishermen, Indian soldiers on the march, groups of officers and scouts. Huffman also printed a good number of prints from Barthelmess’s negatives. Individual albumen and silver prints range in size from 3 x 5” to 6 x 9”. Evelyn J. Cameron (b. 1868, Furze Down Park (Streatham), U.K.; d – 1928, Miles City, Montana). A rugged ranch and outdoorswoman, Evelyn Cameron made documentary views and portraits of life, acquaintances and family near her ranch from 1894 until her death. These photographs are a highlight of Western photography. Like the photographs of Larry Disfarmer her portraits of friends and local scenes show an ease and familiarity that only a neighborhood photographer could have made and sold throughout her community. Raised in prosperous circumstances south of London, Evelyn Cameron first traveled to Montana on her honeymoon with her husband Ewen in 1889. They moved to Eastern Montana shortly after. She and her husband were part of small British group of colonists looking to prosper from ranch and farmland. She enjoyed the rugged Western life where she milked cows, churned butter, cooked meals, raised pet coyotes and wolves, did laundry, gardened (a potato harvest would weigh in at 2000 pounds), broke horses, went on two month hunting trips in the winter, butchered game, and pursued photography. She diligently kept a diary recording such daily activities as pie recipes and photographs printed. She photographed wildlife and birds, illustrating her husband Ewen’s articles on birding and outdoor life. She photographed the badlands and bluffs of eastern Montana, but is best known for her straightforward and authentic views of ranch life. Joseph Dixon (1856, Hemlock Lake, NY; d. – 1926) Trained at the Rochester Theological Seminary, Dixon had a number of pastorates and in 1904 used his speaking talents to deliver slide lectures for the Eastman Kodak Company. In 1906 he was hired by department store magnate John Wanamaker to be the director of his store’s Education Bureau. Concentrating on romantic American Indian mythology his first project in 1908 was a recreation of the Songs of Hiawatha using Crow Indians as actors. The film Dixon made disintegrated, but there were a substantial number of negatives and prints made contemporaneous to the film. In 1909 Dixon embarked on his next project gathering fifty plains and plateau Indian chiefs at the Crow Reservation in Montana to partake in “The Last Great Indian Council”. In 1913 he traveled to over 250 Indian communities on the “Expedition of Indian Citizenship,” photographing the ceremonies while the individuals involved signed a “Declaration of Allegence”. His photographs included mural sized enlargements that were exhibited through the United States in Wanamakers’ department stores, as well as the Panama Pacific Exposition, San Francisco in 1915. The primary collection of Wanamaker related photographs is at the William Hammond Mathers Museum at Indiana University, Bloomington. Alfred Hart (b. 1816, Norwich, Ct.; d. Alameda County, California, 1908) Alfred Hart worked as an itinerant portrait and panorama painter for traveling productions before turning to photography in the late 1850s. He migrated West were he made an extraordinary series of Western Topographic Views as the official photographer documenting the construction of the Central Pacific Railroad from Sacramento, California to Promontory Point, Utah (1864 – 1869. Along with A.J. Russell and C. R. Savage he photographed the joining of the rails. Carleton Watkins purchased the negatives from Hart and published them under his imprint into the 1880s. Lawrence and Houseworth also published some of Hart’s work in the 1860s. Hart returned to painting as his primary medium after this period. Frank Jay (F. Jay) Haynes (b. 1853, Saline, Michigan; d. 1921, St. Paul, Minn.) Haynes began his photography career in 1876 opened his first studio in Moorhead, Minnesota (1876). He moved to Fargo, Dakota Territory in 1879. In 1883 he photographed President Chester Arthur’s late summer excursion in Yellowstone and later that year, under the sponsorship of Henry Villard, photographed the golden spike ceremony of the Northern Pacific Railroad, connecting Minnesota with the Puget Sound. He not only had studios in St. Paul (1895) and Fargo but specially outfitted a railroad car called the Haynes Palace Studio, which served as elegant living quarters, studio, sales room and darkroom. Besides being an official photographer for the Northern Pacific railroad, in 1884 he received a concession for a photography studio in Yellowstone National Park, which was held with his son Jack Ellis (J. E.) Haynes through 1928 (F. Jay Haynes retired in 1916). He also had a successful stage touring business in Yellowstone. Among his assistants and operators at various times were E. W. Hunter and James Paris. Like William Henry Jackson, Haynes was very successful in selling work. He sold hundreds of thousands of views of Indians, frontier towns, people and development, and primarily views of Yellowstone. He photographed with Emerson Hough, advocating hunting restrictions in the National Park. He also traveled to Alaska, Canada and the Northwest United States taking scenic, town, hunting, and frontier views. He worked in many formats and media including stereocards, mammoth plates, albumen prints, photocroms, postcards, lithographs, collodion silver prints on printing out paper, gelatin silver prints, hand colored views, and lantern slides. He even made lithographed images on tourist items like thermometers, calendars, etc. Laton A. Huffman (b. 1854, near Castelia, Iowa; d. 1931, Billings, Montana) When Huffman was eleven his father opened a photographic studio in Wauken, Ohio. Huffman worked for his father and in the mid-1870s set up a studio in Postville, Iowa. In 1878 he moved to Moorhead, Minnesota where he worked for Frank Jay Haynes. In 1879 he was named post photographer at Ft. Keogh, Montana after Stanley Morrow’s stint there. He worked out of nearby Miles City, Montana for the next thirty years with some time off in Chicago. Along with Erwin Smith, Huffman made a remarkable photographic series of cowboy life. He also made views of Yellowstone Park, hunting, herding (sheep, cows, buffalo), western scenic views, as well as portraits and camp scenes of the nearby Crow Indians. He was an avid correspondent with politicians, artists and writers for fifty years and a serious reader. He not only illustrated many articles on the West but his photographs were used as the basis for paintings by such notable artists as Frederick Remington and Charles Russell. He supported himself as a local county commissioner and state representative, a hunting guide, bookseller, and rancher, as well as in promoting and marketing his photographs. He made some albumen prints, generally silver prints ranging in size from postcards to enlargements up to seven feet long. Generally, prints are 6 x 7.75”. He hand colored many prints and also produced monochromatic and hand colored collotypes. The primary collection of his views and extensive correspondence is housed at the Buffalo Bill Historic Center (BBHC), Cody, Wyoming. His negatives are at the Montana Historical Society in Helena. Summer Matteson (b. 1867, Decorah, Iowa; d. 1920) was selling bicycles and Kodak equipment in Denver in 1896. For the next 10 years he actively traveled through the Southwest, often on a bicycle, photographing the landscape and Indians. He made lantern slides for lectures as well as exquisitely crafted platinum prints ranging in size from 3 x 4” to about 5 x 7”. Fred E. Miller (b. 1868, Chicago; d. Hardin, Mt. 1936) Working as a photographer in Iowa and Nebraska before moving to Crow Agency, Montana, Fred Miller was a clerk for the Indian Service from 1898 to 1910. He was also a cattle rancher and judge. He married a part-Shawnee Indian woman, whose sister and neighbor was married to Harry Throssel, the brother of their neighbor, the photographer Richard Throssel. Miller frequently photographed intimate and casual scenes of Indians and Indian life on the Crow reservation until 1910 and sporadically after that time. The combination of a studied and professional eye adopting a snapshot aesthetic combined with his being a neighbor and friend of many of the Crow (his wife and daughters were adopted into the Crow Tribe) resulted in his work being the most intimate and casual of any of his contemporaries. Miller made gelatin silver prints and collodion silver prints, generally from 4 x 6” to 8 x 10”. Frederick Monsen (b. 1865, Bergen Norway; d. 1929) moved to Salt Lake City with his family in 1868. His father was a photographer and Monsen’s resume notes that he had trained as a painter. In 1910 was awarded a doctorate at the University of Christiana, Norway. By 1886 Monsen was avidly if unofficially photographing in the Southwest with the U.S. Geological (Mexican American Boundary) Survey. He photographed with Generals Crook and Miles at the end of the campaign against the Apaches in 1886. Other photographic expeditions included substituting for Frank Nims on the Brown Stanton Survey (1889-1890), the Salton Sea Expedition (1891), Death Valley and other California Deserts (1893), New Mexico Indians (1894 – 1895), the Yosemite National Park Boundary Survey (1896), other investigations of Indians of Arizona, New Mexico, California and Mexico (1896–1911), Mexico, Central and South America (1906-1909), the West Indies and the Orinoco River, Venezuela, 1909-1911. A colleague of Adam Clark Vroman and Arnold Genthe, Monsen favored a handheld Kodak camera, which allowed him to photograph his subjects in candid rather than posed pictures. In 1906, his studio and negatives were destroyed in the San Francisco earthquake. From 1893 until his death he traveled delivering lantern slide lectures. To reconstruct his images after the loss he made copy negatives. His silver print enlargements are among the most spectacular ever made, ranging in size from 2 x 3” to 16 x 21”. Albums of 25 prints are very high to extremely high. A brilliant collection of 373 prints resides at the Huntington Library, San Marino, California. [Carl] Karl Moon (b. 1879, Wilmington, Oh; d. 1948, Pasadena, Ca.) Moon served as a photography apprentice until 1903 when he set up a studio in Albuquerque and began painting and photographing the Indians in the area. He specialized in romantic and pictorial photographs of Indian life that were used for illustrations for his wife Grace Moon’s children books. The photographs were also used by the Fred Harvey Company and the Santa Fe Railroad, for whom he was the official photographer. Moon was active primarily between 1900 and 1915. His gelatin silver prints ranging in size from 2 x 4” to 14 x 20” were often hand colored, and he also made orotones [but not of the quality of Edward Curtis]. His photographs are very painterly and contain subjects popularly used by the Taos founders in their paintings or for promotional art sought after by the Railroad. His most famous view is “Biyazh. Navaho Boy.” A superb collection of his work resides at the Huntington Library, San Marino California. Stanley J. Morrow (b. 1843, Richland County, Ohio; d. 1921, Dallas, TX) Morrow learned photography from Matthew Brady late in the Civil War, and in 1864 produced stereo views of Ft. Lookout and other scenes under Brady’s imprint. In 1868 he moved to Yankton, Dakota Territory where for over fifteen years used the booming city as his base. As he traveled he set up a number of satellite studios throughout the Dakota and Montana area including Miles City, Montana. His primary format was the stereoptican view, but he made ambrotypes, carte de visites, and cabinet views of Indians such as Red Cloud and Sitting Bull, early photographs of the Little Bighorn including the burial of the bones, with Gen. Crook in the Black Hills in 1876, steamboats, Indian life, and many other western views. Using wet plate negatives he nevertheless was able to produce remarkable documentary images of the West. William S. Prettyman (b. 1858, Delaware; d – 1932, California) apprenticed with veteran civil war photographer I.H. Bonsall then living in Arkansas City, Kansas. Soon after Prettyman set up a studio and a traveling photography wagon pulled by oxen. He stayed in Kansas for 10 years before moving to Oklahoma Indian Territory where he served as mayor of Blackwell, Oklahoma. In 1905 he moved to California where he was in the wholesale drug business and developed an orange grove. Bonsall’s and Prettyman’s Arkansas City negatives became owned by George W. Cornish, who bought his studio there. Prettyman’s style is journalistic and documentary rather than pictorial. He made a wide range of documentary views of Indian and frontier life, including well published news views of the land rush into Sauk and Fox territory in Iowa and into Cherokee land in Oklahoma. Generally he made albumen prints and some silver prints, cabinet card and boudoir size up to 8 x 10”. Frank A. Rhinehart (b. 1862, Illinois; d - ?) Rhinehart was most famous for his platinum prints of the Trans-Mississippi and International Exposition in Omaha in 1898. He made portraits and photographed re-enactments of Indian scenes as 6 x 8” to 8 x 10” platinum print. A few larger platinum prints, often hand colored, exist and are moderate. Rhinehart worked with William Henry Jackson and employed Adolf Muhr to make platinum prints (Muhr later made platinum prints in Edward S. Curtis studio). He also made a significant series of silver print stereocard views among the Crow Indians in the late 1890s. Buyer Beware: Rinehart’s successor studio in Omaha, the Rinehart/Marsden studio, continued making silver prints in sizes up to 16 x 20”. Royal Sutton also produced a series of toned silver prints in the late 1950s. Will Soule (b. 1836, Turner, Maine; d. 1908, Brookline, Mass.) From 1868 though 1874 Soule made a celebrated series of photographs of field and studio views in Ft. Dodge, Kansas and Ft. Sill, Oklahoma. Posted as a clerk to the trading posts at the forts, Soule made straightforward portraits of some of officers, scouts and Indians, including the most famous Indian Raiders of the time iSatanta and Satank. His most famous view is of “The Scalped Huinter.” Generally, he made 5 x 7” albumen prints on decorative mounts, with trimmed prints for cabinet cards. Erwin E. Smith (b. 1886, Honey Grove, Texas; d. 1947, Bonham, Texas) As a teenager Smith became a skilled cowboy who constantly sketched scenes and read. Eventually, he combined his passion for art and western ranch life in photography. He began publishing images of cowboy life in 1905. He studied art at the School of the Art Institute of Chicago and then studied photography and art at the School of the Museum of Fine Arts, Boston. From 1905 to 1915 he was active photographing many ranching and cowboy outfits primarily in Texas and New Mexico, illustrating articles, and making photographic albums. He sporadically pursued these endeavors throughout his life while being involved with ranching and farming endeavors. Smith worked in gelatin and collodion silver prints ranging in size from 2.25 x 3.25” to 12 x 16” and slightly larger enlargements. His work is extremely rare. Richard Throssel (b. 1882 - Marengo, Washington, d. –1933, Montana) Known as one of the first great Native American or First American photographic artists, Throssel was of Scottish Indian (Canadian Cree) descent (Metis). His grandparents had settled with a small Metis colony in Washington Territory in 1841, working for the Hudson’s Bay Company. Throssel moved to eastern Montana in 1882 and lived at Crow Agency with his brother Harry who had obtained a job for Richard as a clerk for the Indian service. Living next door to Throssel was the photographer Fred Miller. Miller’s part-Shawnee Indian wife Emma’s sister Myrtle was married to Harry Throssel. Described as Indians Without Tribes all but Miller were adopted into the Crow Tribe, allowing them to receive land and claim Crow identity though not permitted to participate in ceremonial privileges. Throssel early in his life was interested in art. At the Crow Agency he took painting lessons from Joseph Sharp, a prominent member of the Taos Founders, as well as a skilled photographer. 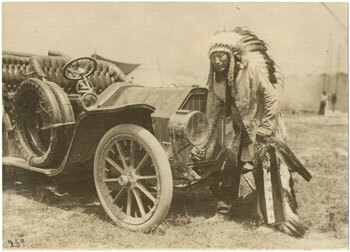 In 1905 he met Edward Curtis and had an artistic epiphany about the capabilities of photography. Curtis became a personal friend and mentor. Throssel contributed a few pictures to Curtis’ North American Indian project and contributed images to Joseph Dixon’s Wanamaker Expedition project. Throssel is known for his picturesque pictorial views in the style of Curtis, and used the same platinum print papers Curtis used. Throssel also made a significant body of documentary work for the Indian Service on Indian health issues and for his friends and family, taking many informal portraits and scenes we would today call documentary with a vernacular edge. In 1912 he moved to Billings where he established the Throssell Photocraft Company and pursued his interests and livelihood in newspaper photography, outdoors activities such as the National Rifle Association and politics, becoming a State Representative to the Montana Legislature in the 1820s. G. Ben Wittick (b. 1845, Huntington County, Pennsylvania; d. 1903, Ft. Wingate, New Mexico) Wittick had his first studio in Moline, Illinois. By 1878 he had a wife and five children and a successful studio, but filled with a desire for adventure in the west he became the official photographer for the Atlantic & Pacific Railroad. He moved west working for the railroad and set up a series of studios in Santa Fe (1879), Albuquerque (1881 with F. W. Russell), Gallup (1890s) and Ft. Wingate (1886 - 1903). He was very successful in marketing his photographs, which tend to be descriptive and are more reminiscent of earlier delegation photographs and field views of the Geologic Survey photographers. Primarily he made scenic images of natural wonders of the Southwest, as well as Indian life among the Navajo, Hopi and Zuni. He became known as the first photographer to make images of the Hopi Snake Dance. When he died in 1903 while collecting rattlesnakes for the Hopi Snake Dance it was said that the words of the snake priest from years before predicting his death at the fangs of a snake had been fulfilled. Wittick’s formats ranged from albumen print stereocards to silver prints up to 11 x 14”.